With a prompt of “Going to the Chapel” this is the perfect time to write about Lou, my first cousin three times removed. This is my maternal grandfather’s side of the family. Lou was born on 25 June 1870 in Gibson, North Carolina, to William Atlas McKenzie (1828-1878) and Sarah Margaret “Maggie” Gibson (1848-1917). She had two younger siblings: Anna Jane McKenzie (1872-1895) and William “Willie” Nelson McKenzie (1875-1938). Her father was a carpenter and kept a farm with a few animals and a field of cotton. Lou was just shy of her eighth birthday when her father died at the age of 49. Lou’s mother had a bit of help in working the farm, but the main income came from a life insurance policy (mentioned in the probate records). Lou went on to finish high school and go to college. She borrowed money from a friend to pay her college tuition and set out to pay her debt after graduation by working as a school teacher at a small school. In late 1888/early 1889, Lou was the maid of honor at her cousin Julia’s wedding. The best man was Daniel C. Roper, a former classmate of the groom, and a school teacher himself. Upon being introduced, Roper recalls, “my reactions were similar to those of any other young man who realizes he does not care to look farther in the selection of a wife.” They began a correspondence and visited each other about once a month (they lived about 11 miles apart). 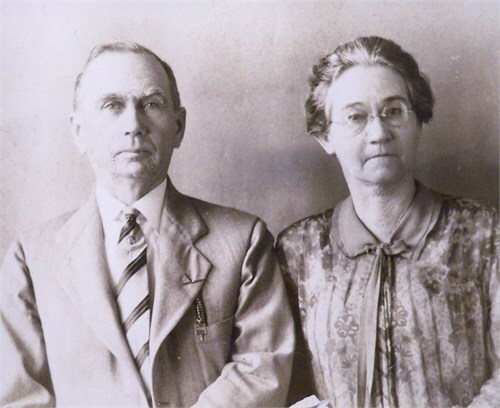 Love blossomed, and despite Daniel’s reservations about being able to support a wife, they were married on 25 December 1889 by J. T. Lyon, a Methodist Minister, in Richmond County, North Carolina, probably in Gibson. (This was before Scotland County was created, which is where Gibson is located today.) They understood each other’s purpose, were convinced of the necessity of cooperation, and understood each other’s finances. They created a happy home environment they believed would attract people with like goals, and provide a positive influence on their children. They strove for “correct living” that included treating others well and shying away from selfishness and greed. They didn’t want to be rich, but have enough to educate their children so they would not be a burden on society. At the beginning of their marriage they lived with Lou’s cousin, Dr. John C. McKenzie, the local family doctor. They were both teaching school and saving their money for a place of their own. Daniel was able to take out a five-year loan from the bank to purchase farmland, and managed to pay out of his teacher’s salary a bit each month to the contractor for the house he built on the land. They moved into the house in the fall of 1890, just after their first child was born. Margaret May Roper came into the world on 10 October 1890 in Darlington, South Carolina. Son James Hunter Roper was born the following year on 23 November 1891 in McColl, South Carolina. When Margaret was born, Daniel came to the realization he couldn’t support his family on a teacher’s salary, so he quit and took up life insurance sales. His territory included most of Marlboro County and he got to know lots of different people. He was asked to run for the State House of Representatives in 1892. He won and served one term. This was the beginning of Daniel’s, and hence Lou’s, years in public life. Son number two, Daniel Calhoun Roper, Jr., was born 1 November 1893 in McColl, South Carolina. While Daniel was in Columbia, Lou ran the farm. Her years of experience helping her mother came in handy. At the end of his term in the legislature, Daniel accepted the job of Congressional Staff Clerk for the Senate Committee on Interstate Commerce. The family moved to Washington, D. C. While there, daughter number two, Grace Henrietta Roper, was born on 26 November 1895. At the end of their time in Washington, Lou and Grace became very ill. Daniel wanted to accept a job in New York managing an office that did work similar to the Committee on Interstate Commerce, but he was wary of moving his family, especially with Lou and Grace so sick, from one humid place to another. Fortunately, Daniel’s new boss had a home in New Jersey he wasn’t going to use that summer and offered it to the Ropers rent free until they could find a place. But Lou and Daniel never could get used to life in New York, so Daniel sought a job closer to Washington and ended up selling insurance in Baltimore. Before the move back to Washington, son number three, John Wesley Roper, was born 31 May 1898 in Gibson, North Carolina. After the move, Daniel took the civil service exam, which set the Ropers on the next leg of their life in public service. From 1900 until 1910 Daniel worked for the Census Bureau. While he was trying to figure out how much cotton was produced, Lou was taking care of the children. During these ten years, two more sons were born in Washington, D. C.: Harry McKenzie Roper on 30 July 1901, and Richard Frederick Roper on 25 February 1908. Following his stint at the Census Bureau, Daniel served as Congressional Staff Clerk for the House Committee on Ways and Means (1911-13), the First Assistant Postmaster General (1913-16), and Commissioner of the Internal Revenue Service (1917-20). It wasn’t all work, though. There were weddings! Margaret married David Robert Coker (1870-1938) in 1915. Daniel Jr. met a girl, Marie Germaine Jeanniot (1893-? ), in France when he was stationed there during World War I, and married her on 25 July 1918 in France. Another break in public service occurred between 1920 and 1933. Daniel had finished law school, receiving his LL. B. from National Law School in Washington, D. C. For the first year he was president of Marlin-Rockwell Corporation, leading them through the transition of manufacturing guns for war to something more useful during peace time. After that year he set up a law practice with several other attorneys. There was also time for family. Lou and Daniel went on a trip to Bermuda in 1921. Grandchildren began to arrive. Margaret and David had a son and three daughters (the son died in infancy). Daniel Jr. and Marie had three daughters. Fred married Monte Christine Blalock (1908-1985) in 1928 and they had two sons. Harry married Katherine Nelson Corder (1906-1975) on 5 March 1929 in Frederick, Maryland and they also had two sons. John married Hazel Catherine Nelson (1898-1978) sometime after 1930 and they had a daughter. In 1933 President Franklin D. Roosevelt appointed Daniel Calhoun Roper as his Secretary of Commerce. He served in this capacity until 1938. Lou was a great asset to Daniel in his duties when he traveled, and he was thrilled when Lou, along with her dear friend Mrs. Gertrude Julian (wife of the Treasury Secretary), received an invitation from the Ambassador to England to come to London and be presented to King Edward VIII. The two couples traveled to England for the garden party. Lou and the Julians traveled on the Queen Mary, while Daniel followed a week later on the Manhattan. (He felt as Commerce Secretary he should travel on an American ship even though it was at his own expense; a few of his traveling companions were the 1936 Olympic team on their way to Berlin.) During this time the last of the Roper children married: Grace found love later in life and married Frank Arthur Bohn around 1935. In early 1939 Daniel accepted a limited appointment as United States Ambassador to Canada. There were some tricky trade deals in the works, and the President wanted Daniel at the table. On one occasion, Lou and Daniel had the chance to meet and talk with King George VI and Queen Elizabeth. The King was very uncomfortable in the warm weather with his heavy uniform and asked of Lou, “How do you people stand it?” She replied that they ate and drank according to the weather, and she pitied him in his hot uniform; after all, she informed him, lighter materials were used for summer uniforms on this side of the Atlantic. The King was worried about the welcome he would get in the United States on his visit that started the next day, but Lou was able to allay his fears. He had also heard about a bad electric storm heading for Washington and asked Lou if it had arrived yet. “I don’t know, Your Majesty,” she replied, “but my opinion is that you will prove to be the electric storm.” He thought that funny. A reception, glimmering in its golden decorations and significance, marked the fiftieth wedding anniversary yesterday afternoon of Mr. and Mrs. Daniel C. Roper, who, with their seven children, held a wide-open house in the grand ballroom of the Mayflower. There from 5 to 8 o’clock, headed by the First Lady of the Land, the Washington world called to do them homage. Almost the first arrival to offer the hosts congratulation was Mrs. Franklin D. Roosevelt, who brought along the President’s best wishes and in turn received their thanks for the lovely yellow roses which had been the anniversary remembrance from the Roosevelt family. Mrs. Roosevelt was wearing a jaunty black beret with her black costume and caught the holiday touch with one huge pink rose pinned on her coat. Mrs. Roper looked equally smart in a black and gold brocade gown made on simple straight lines and a most becoming brimmed hat with ostrich plumes curling on the side. She had on a pair of antique bracelets which she had worn with her wedding gown, and about her throat was a magnificently carved gold necklace which had once belonged to a royal Mexican family and which was an anniversary present from a friend in California. It was not difficult to understand the flush of happiness on Mrs. Roper’s cheeks yesterday and the glow of pride she felt in the young man who had won her “yes.” Together they have found a home of peaceful beauty that is always filled with flowers. They have seen their children grow to emulate their own success. Together they have won some of the highest honors in the land. But the happy glow of yesterday’s gathering was something even more precious than all that. It was the vital living love the Ropers have enkindled in all who have ever come to know them or be associated with them. The Ropers settled down to private life again. Daniel went back to practicing law and wrote a book, Fifty Years of Public Life, published in 1941. (The quotes and some other information in this blog post came from that book and you can access it here. It’s a very interesting look at public service and politics in the first half of the 20th century.) Daniel died from leukemia in Washington, D. C. on 11 April 1943 at the age of 76. Lou died less than seven months later on 8 January 1944 at the age of 73. They are buried side by side at Rock Creek Cemetery in Washington, D. C.
This entry was posted in 52Ancestors, McKenzie. Bookmark the permalink. Well, now. They certainly led very fascinating lives! Very interesting and well-written.